This coming October, I’m pleased once again to be returning to the Merrimack Valley Halloween Book Festival. It’ll be held on Saturday, October 13th, 2018, from 10am to 4:30pm at the Haverhill Public Library, which is in Haverhill, MA. It’s some pretty heady company in which to find yourself. Thanks to Chris Golden for inviting me once again to be part of the event. I suppose it’s only appropriate that October should be a busy time for a horror writer. Of course, there’s good-busy and bad-busy. The last couple of weeks have definitely fallen into the former category. The first two Saturdays of the month were taken up with events related to the release of Seize the Night, the anthology of scary-vampire stories edited by Christopher Golden, and full of more great stories than you can shake a stake at. On October 3rd, I drove up to North Andover for the Merrimack Valley Halloween Book Festival. 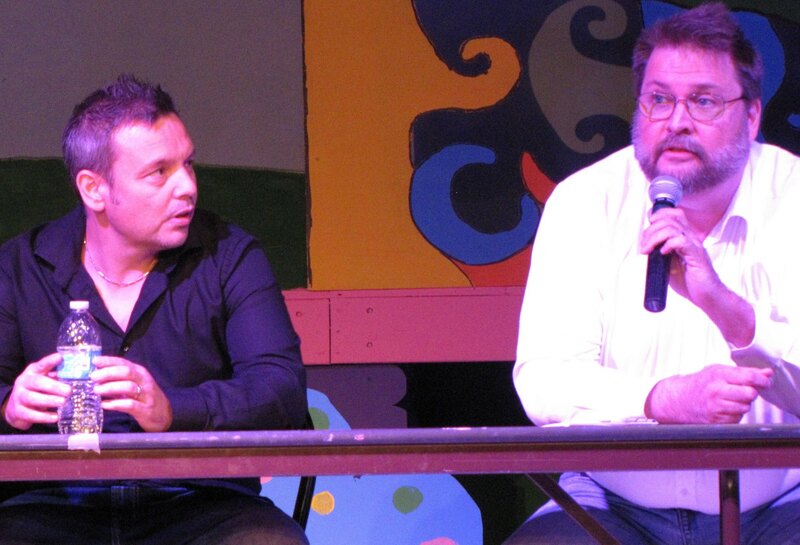 This was held at the ACT theater, a community theater located in the recesses of a converted industrial site. 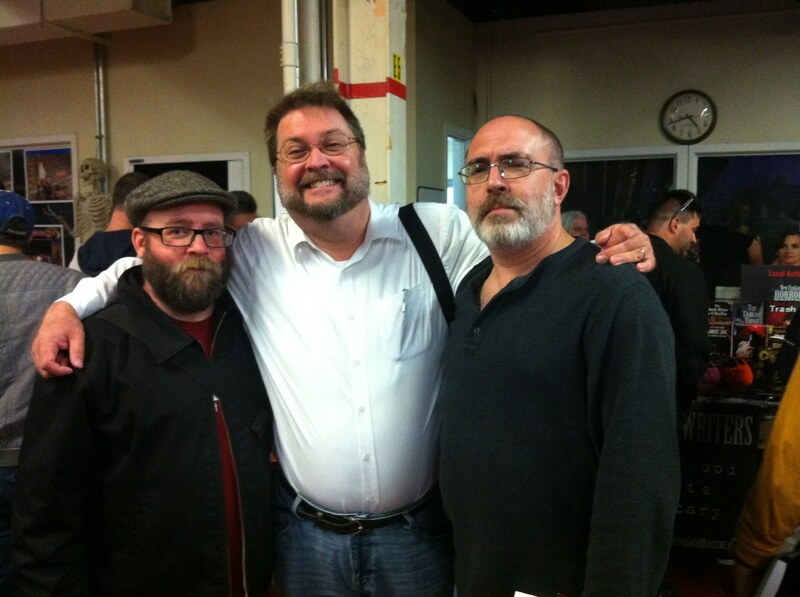 There were a ton of horror writers there, and even more horror readers. The theater itself (which, appropriately enough, was set up for Seussical the Musical) hosted a series of hour-long panels on an assortment of horror-related topics, while the space immediately outside the theater (where, I’m guessing, concessions would normally be located) was set up with tables for book selling and signing. I took part in a panel on Seize the Night at the beginning of the event, and was part of a brave attempt to read all of Stevenson’s Strange Case of Dr. Jekyll and Mr. Hyde at its end (after two hours, we were about three-quarters of the way through it, but decided to stop for dinner). 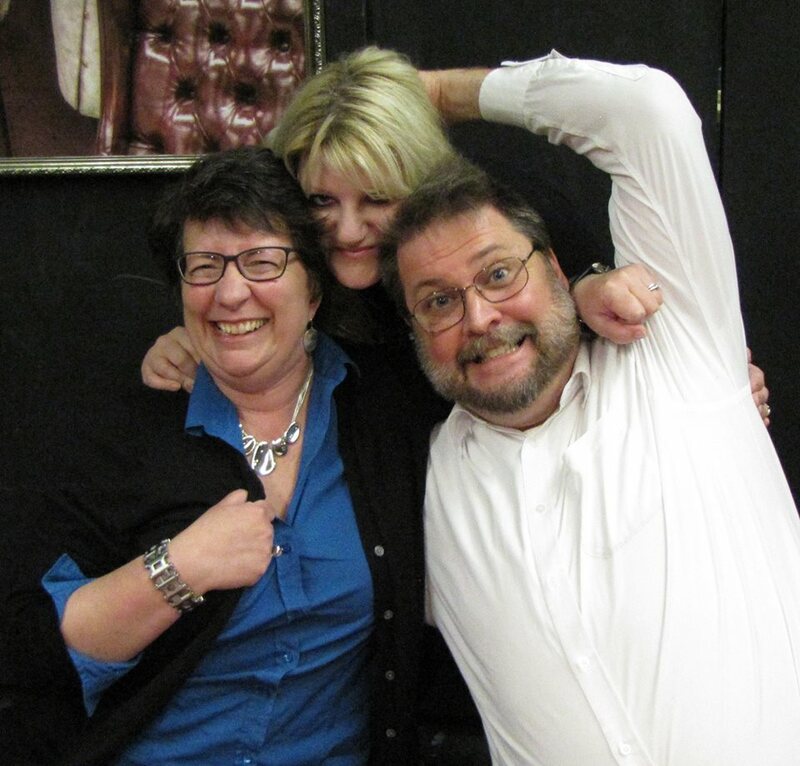 In between, I signed and sold books, and spent time with some wonderful people: Paul Tremblay, Sarah Langan and J.T. Petty, Jack Haringa, Brian Keene and Mary SanGiovanni, Rio Youers, Dana Cameron, Kelly Link, S,J, Bagley, Gardner Goldsmith, Bracken MacLeod, Barry Dejasu and Catherine Grant, and of course Chris Golden. Rio Youers can’t believe how pink I am. Are Jack Haringa and I judging you? Of course we are. I’m happy to be with S.J. 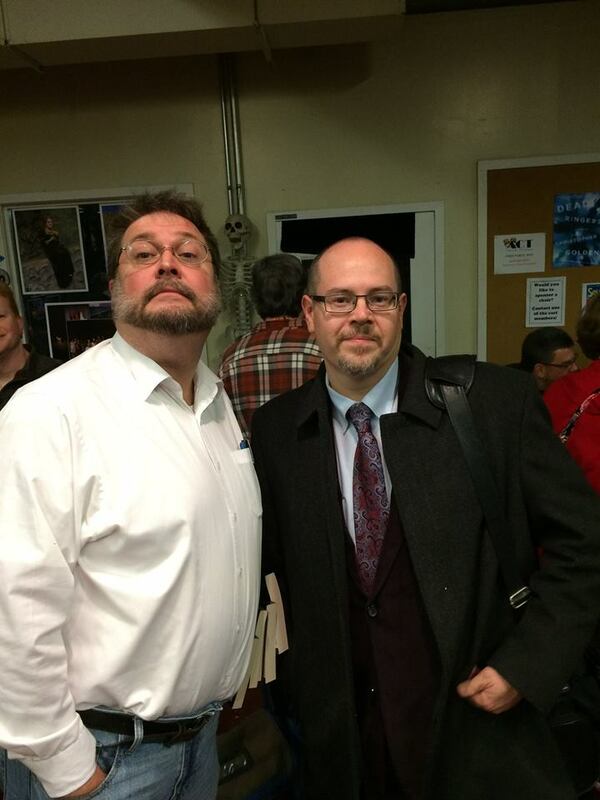 Bagley and Brian Keene. They are more dubious. 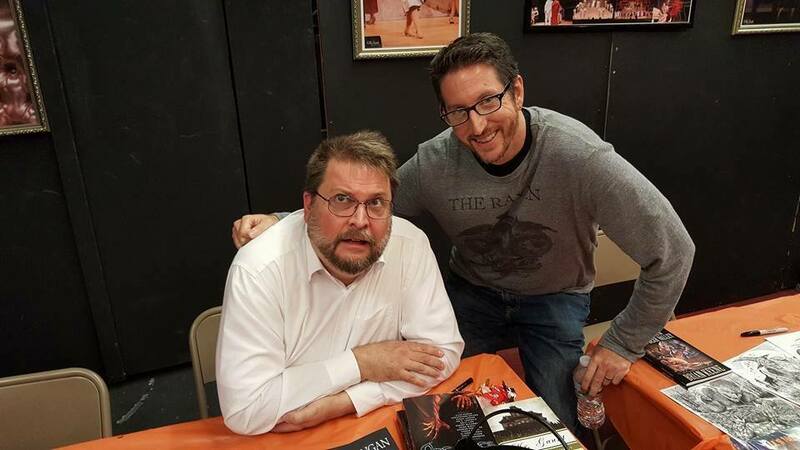 Paul Tremblay and I, immediately before the spiders rained from the ceiling. Dana Cameron and I love our fans! I have to say, I don’t think I’ve ever been to one of these events at which everyone–writers, fans, support staff–was in such a good mood. It was like a huge party. Afterwards, Jack Haringa and I joined everyone else for a huge dinner at a local brewpub, during which Kelly Link and I talked weird anthology ideas (the MANthology, anyone?) 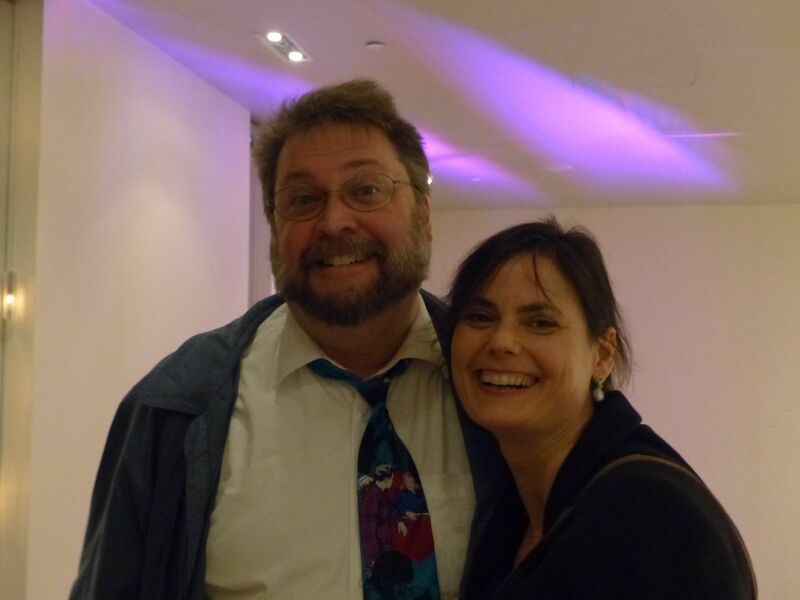 and I had the chance to speak with noted editor Jaime Levine. Thanks to everyone who came out and made the event such a success. Thanks, too, to Chris Golden for doing such a fine job organizing it, to the folks at the ACT theater company for hosting and staffing it, and to the Andover Bookstore for selling copies of everyone’s books. This was a huge effort on Chris’s part, but if he decides to put this on again, next year, you can be sure I’ll be at it–and so should you. 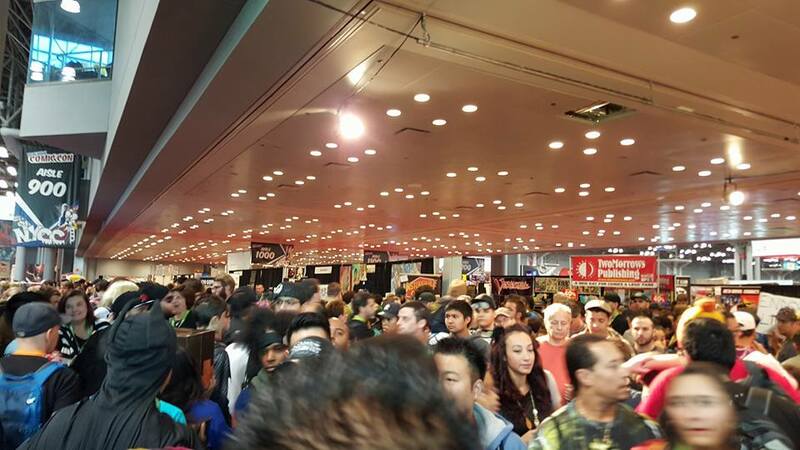 The following Saturday, I took the train down to Manhattan so I could attend my first-ever New York Comic Con. There were people in costume boarding the train in Poughkeepsie, and their numbers grew with each stop. 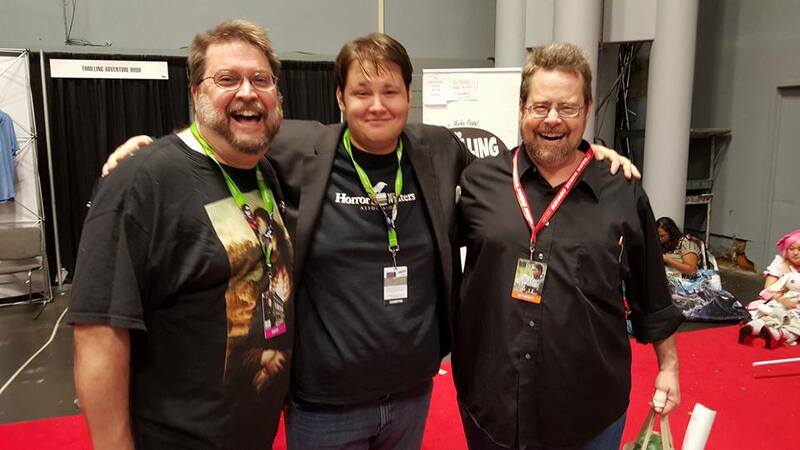 By the time I was walking to the Javits Center, I was a decided minority, with my jeans and zombie Mona Lisa t-shirt. Ed Schlesinger, the editor at Simon & Schuster who worked with Chris Golden on Seize the Night, met me outside the Center, bestowed a pass on me, and escorted me inside to the madness that is Comic Con. If you’ve seen pictures of the event, then you have some idea what it’s like: a crush of people, many of them in costume, wandering aisles flanked by booths full of comic- and genre-related people, publications, clothing, toys, videos, video games, and memorabilia. Right away, I was in love; although I think I was grateful that I didn’t have that much money with me. Dana Cameron and I met up at the Simon & Schuster booth, and Dana, who had been at the convention for days at that point, was good enough to help me in my quest to find a Hawkeye t-shirt and copies of the first couple of Hawkeye collections for David. We returned to the S&S booth in time to meet up with Chris Golden, and then the three of us sat down to sign some books. In between signings, Ed Schlesinger, who’s very charming and funny, told us how brilliant the three of us were. After the signing was over, Paul Tremblay and I wandered the convention floor, both of us bemoaning an assortment of childhood toys foolishly discarded before we realized they could have paid our kids’ ways through college. Once Paul left to catch his train, I made my way over to the Horror Writer Association’s booth to meet up with Ellen Datlow for dinner. On the way, though, was the convention’s great surprise and treat for me: Glass Eye Pix had a booth there. If you’re not familiar with it, it’s writer/director/actor Larry Fessenden’s production company. Larry’s behind a number of my favorite horror films, including Habit and Wendigo. Not only did the booth have Blu-Rays of his latest effort, Beneath, but Larry Fessenden himself was there to sign them! Because I was on my way to Ellen, I didn’t have time to do much more than shake Larry’s hand enthusiastically and gush about how much I love his work. Still, what a thrill to meet such a great filmmaker. 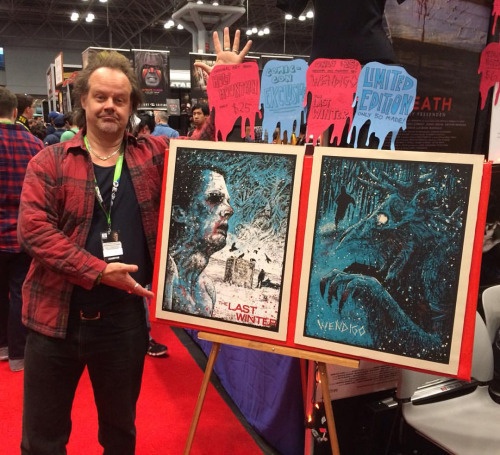 Larry Fessenden at NYC Comic Con with specialty posters of a couple of his films. After some shenanigans at the HWA booth with Trevor Firetog, Patrick Freivald, and James Moore, Ellen and I headed out for a nice dinner at an Italian place that wasn’t too far from the Javits Center. 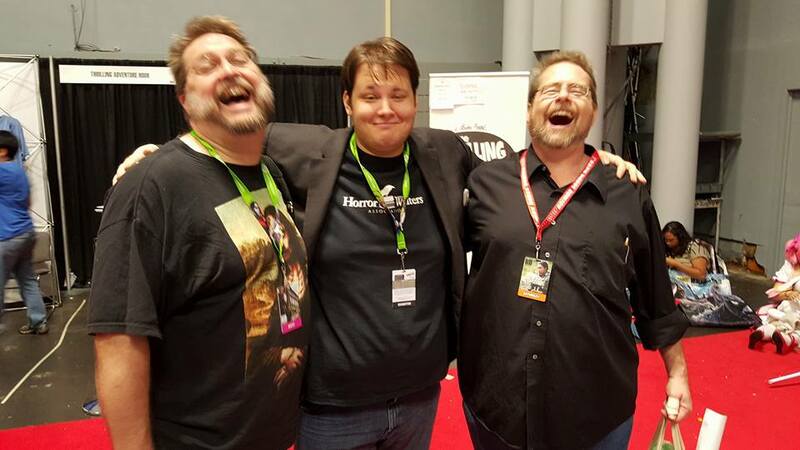 Me, Trevor Firetog, and James Moore, expressing our delight in one another’s company. 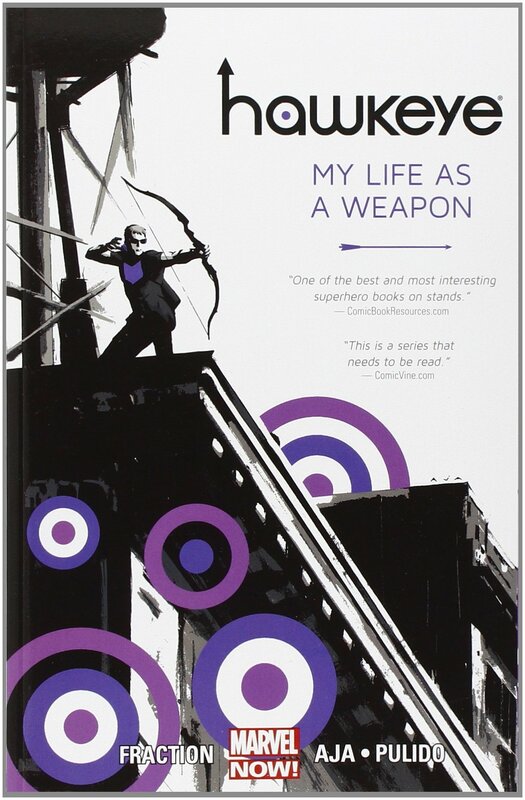 Then it was back home, in time to catch David still up and give him his Hawkeye shirt and comics. His reaction may have been the highlight of my day; scratch that: it was the highlight. Thanks to Ed Schlesinger and Chris Golden for making my first trip to Comic Con happen; and thanks to the folks at the Simon & Schuster booth who helped make the signing go smoothly. You can be sure, I’ll be back for this next year. 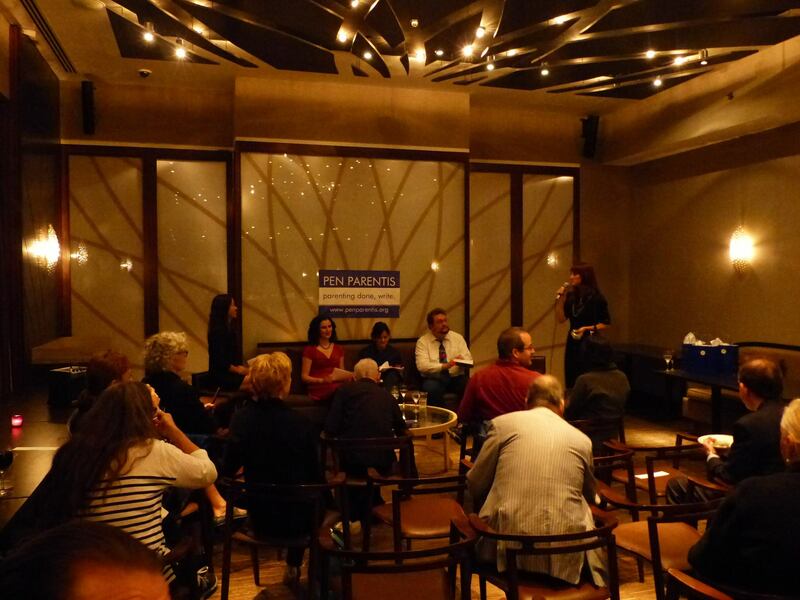 The Tuesday after Comic Con, I was back in Manhattan, again, this time for Pen Parentis‘s monthly salon at the Hotel Andaz. Together with the fabulous Veronica Schanoes and my (not?) cousin, Sarah Langan, I read from my work and then took part in a far-ranging discussion about writing while raising small children, writing horror as a parent, and writing effective horror. It was great to see Nick Kaufmann and Alexa Antopol there, as well as Dan Braum. M.M. Devoe and Christina Chiu did a fabulous job organizing and MC’ing the evening. 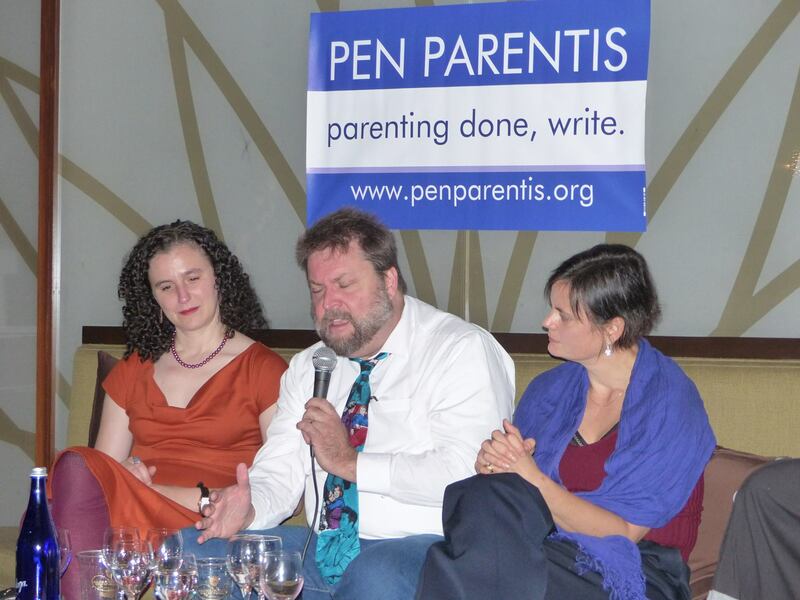 This was my second time back at Pen Parentis; I’m grateful to them for having me. I look forward to number three. Veronica Schanoes, Sarah Langan, and yours truly, flanked by Christina Chiu and M.M. DeVoe, in the swanky Andaz Hotel. I’m not saying I sang Elvis’s greatest hits, but the camera doesn’t lie, does it? Oh, and afterwards, there was Japanese food. Just sayin’. The morning after Pen Parentis, I was up early (well, for me) to travel with the Honey Badger up to the New York/Vermont state border, where an intrepid film crew was nearing the end of principle photography for their film adaptation of Laird’s story, “30.” The drive went more quickly than we’d thought, through some lovely, if increasingly-remote, country. We arrived at what I guess you could call base camp in time for lunch with the director, Phil Gelatt, producer Will Battersby, and just about all of the crew. That everyone was happy to see us had nothing to do with the beer and homemade cookies Laird had brought. Phil Gelatt is a lovely and talented guy; he wrote the script for Europa Report, which convinced me he’d be the perfect guy to adapt “30.” We’d met at this past Necronomicon Providence, where we’d had a pleasant conversation about this very project, and it was pretty wild to see him now engaged in it. After the meal, we accompanied everyone to the location of the principle outdoor shoot, where we were allowed to watch part of what I think will be a pretty creepy scene being filmed. Will Battersby stood with us and patiently and thoroughly answered the questions with which Laird and I barraged him; it was quite the education. I left impressed by the sheer effort involved in bringing just a minute of film to the screen. Laird was pretty happy with everything he saw. Out of respect for Phil and the crew, neither of us took pictures of the set, but they’ve set up an instagram account where you can see some of what they’re up to. Thanks to Phil, Will, and the entire crew for being so accommodating of the two of us, and thanks to Laird for asking me to tag along. So there you have it: a pretty busy couple of weeks. Thanks again to everyone who’s played a part in making these things happen. If I signed a book for you or talked to you, thanks very much. And now, it appears I’ll be at this coming week’s New York Comic Con, signing copies of Seize the Night alongside Christopher Golden and Dana Cameron. If you’re there, please stop by and say hello. When: 10/3/15 from 1pm till 7:30pm. DOORS WILL OPEN AT 12:45 p.m.
What: Horror and Suspense authors from New England – and all around the Northeast U.S. – will be selling and signing books throughout the event, and participating in panel discussions in the theater about New England Horror Tradition, what makes something scary, new fears, and childhood terrors. The event will conclude with a quintet of authors doing a live reading of Robert Louis Stevenson’s classic Dr. Jekyll and Mr. Hyde. Sponsored by ACT Theater Company, Andover Bookstore, and Vicious Circle. Please note that ACT Theater Company is located in a converted industrial space at Osgood Landing. I guarantee you will think you are in the wrong place when you arrive–it doesn’t look like a theater, but it is! To reiterate: IT’S FREE to attend; though the folks putting this on are asking you to register for a ticket so they’ll know how many people to expect. If you can make it, that would be great; please say hello.